Once, there were classical theatrical texts, and performance styles had to be reimagined, as happened in the Renaissance; later, there emerged hybrid recording media that flashed text and performance simultaneously before audiences; in between, the rival media of publishing and stage performance ceaselessly borrowed from each other, bickered, competed and conspired, in a process that raised the stakes for both. 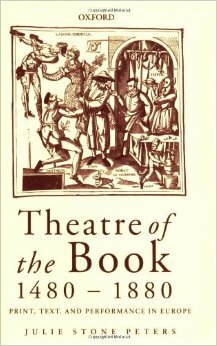 Julie Stone Peters’s Theatre of the Book traces the history of visual, verbal and theatrical representation over four centuries with copious documentation, scholarly verve, and subtle interdisciplinary attention. At once a study in media theory, a philological and bibliophilic scrutiny of the transformation of plays into texts, and a genealogy of a number of leading themes in the formation of early-modern or modern sensibility, this rich book invites us to look at the “Gutenberg era” in new and non-exclusive ways.